Whether you are relocating to a different state (within US or Canada) or sending valuable stuff to your loved ones, you would want a reliable domestic freight service to tackle your stuff and we can guarantee you that rail freight services are one of the best options. In this cargo service, several goods trains or freight cars filled with transportation goods are pulled by trains. Why Choose Rail Freight Services? There are several benefits of transporting goods through domestic rail freight services but the main reason what motivates people to choose this mode of transportation is that trains can carry heavy containers and bulky stuff safely across a wide distance. Rail transport serves as a very reliable and efficient transportation mode given that it consumes less energy and covers more distance. All the rail traffic is closely monitored and supervised by the railway managers, which guarantees the safety of your transporting goods. Moreover, rail transportation is one of the environmentally efficient options. It has been observed that rails are responsible for only 0.6% of the diesel emissions; therefore, making it an eco-friendly and green transportation option. As compared to other domestic freight services, rail is a very cost effective option and it can carry more goods. The service charges will; however, vary with respect to the destination and the total distance covered. The downside of this freight service is that it may consume longer time than other transportation services. The service charges are dependent on several factors; here is the list! 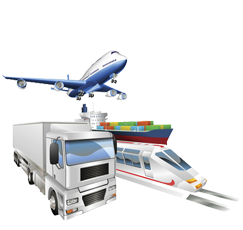 Weight – The weight of the cargo is one of the key factors that govern the overall cost. Majority of the rail freight services have online guides to inform the customer of their service charges. In order to speed up the shipment process, it is better for you to weight the cargo or goods before the shipping process starts. Number Of Goods – The increase in size corresponds to the increase in charges as well. Once again, this information can be easily extracted online. We advise you to check this information before purchasing the goods as this will give you a chance to manage your budget. Nature Of The Goods – Perishable goods need to be transferred at a higher speed than the non-perishable ones. This is why the shipment of the prior items will cost higher than the subsequent ones. Similarly, urgent transportation will be expensive as compared to the regular one. Distance Covered – This is the rule of thumb with every transportation mode: the longer distance costs higher. It is up to the company to decide how much they should charge for respective distances. However, these days the distance factor is losing its importance; as some companies charge the same for longer and shorter distance alike. There are other factors too that indirectly affect the cost of shipment. However, the above-mentioned ones can be controlled and altered with respect to your preference. So, don’t forget to take them into account!